Hi, I’m so glad I found this site, I’ve found it to be the most helpful, especially reading peoples’ comments. I know there is no right answer to this but I do want to get it as right as possible and not to end up in a position where in a year it’s all gone wrong and I’m selling my kit. Because we get foxes and have a couple of flower beds and some veg (that I want to try to keep nice) I plan on keeping them in their run more than out free ranging. The run will be fixed. I’m hoping to have a run about 4m X 3.5m I will put the coup in this run, raised off the ground so the hens get to use all of the floorspace, plus get shelter when needed. I’m thinking of putting bark chippings down, adding a tyre with sand and ash from our open fire for a dust bath and greens hanging up for them to jump up to to keep them amused. As for letting them out, it depends how much the garden gets destroyed. I want them out as much as possible but this could in reality only be an hour or so every evening when I can keep an eye on them and usher them out the flower beds, although I’m hoping the dust bath in their run will stop too much dust bathing in my border. I’m expecting to replace the wood chips about 3 or 4 times a year. 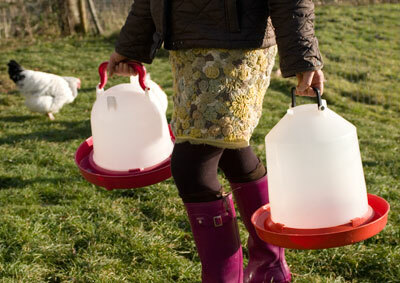 Is it fair on the chickens to keep them in a pen this size, best case 22 hours a day ish, worst case, all the time. I know they are happiest free ranging but I can’t do that, so I want to strike as best balance of happy hens and the space I’ve got as possible. 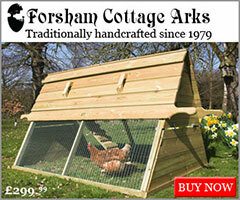 You mention bark – this shouldn’t be used as it can contain mould spores which cause aspergillosis in chickens. 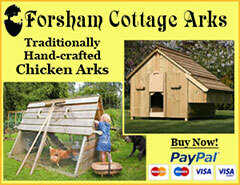 Wood chips are fine and some specialist poultry suppliers sell these. Wood ash should also be mixed with other things such as dry sand or compost as it is too dusty on its own – chickens are particularly prone to respiratory problems. What’s fair on the chickens is hard to quantify. When I see 6 hens in a small run at our local pub beer garden with no greens or free range, I don’t feel happy but the hens seem healthy enough. Battery hens hardly have a reasonable life yet people still buy caged eggs and products that use caged eggs such as pasta or ice cream. All I can say is they should have a better life than many hens and if you give them the best life you can, you’ll be rewarded by seeing them so happy! We have had chickens since March this year, at first they used to all go back into koop to sleep on their perch, in the summer we installed a perch outside for them, they sit on it during the day. After a while they started roosting on it and sleeping there all night. Now the weather is getting cold we thought they should go back into koop to sleep but they wont go back in, even if we remove the outside perch, they just wander around lost. Are they ok to sleep outside during winter? we are worried now they are not clever enough to go back in to sleep and they will freeze outside, any ideas?? thanks. Yes, they will need shelter from the rain and wind over the winter. 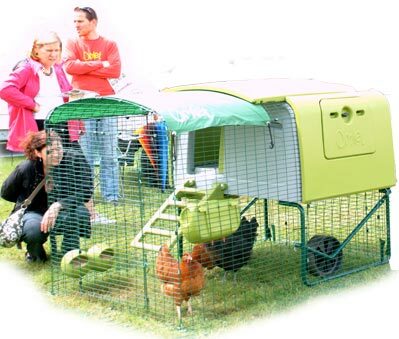 Chickens will get used to their coop or in your case ‘roosting place’. 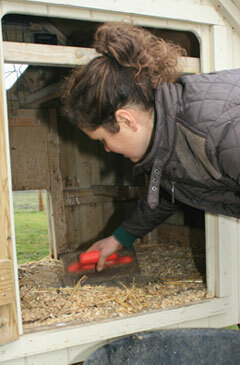 If you put a new coop next to their old, they will continue to use the old one through habit. I think your website is one of the most thorough sources of info for hen keepers so it’s a shame you are recommending bumper bits as a means of preventing feather damage. 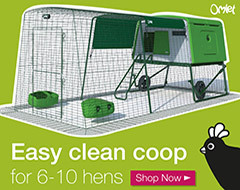 In a small flock you should be able to reduce it with management practices – such as adding extra pecking objects (hanging whole cabbages, straw bales), providing extra space and areas to escape to (high perches / barriers). 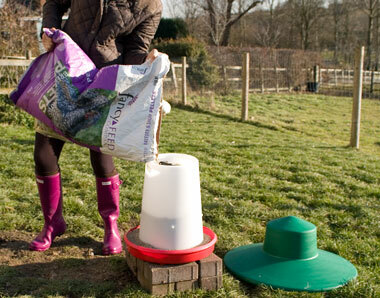 It can also occur if there is competition for feeder / drinker space so additional feeders / drinkers could also be added. Because bumper bits prevent feather pulling they are also likely to frustrate your birds as they wont be able to properly utilise their beaks.